Had a wonderful experience. Wichita River runs along edge of campground and because of all the spring rains, was running quite high. There is a pond on site. It was such a joyful place to be! Geese on pond - flying in and out - beautiful to watch. Very peaceful site. We stayed an extra day to enjoy the environment. The facility is very nice with wide pull through sites and cable. I say cable because we are on a cross country trip and you can not believe the places that advertise they had cable and WiFi only to be told when we got there they did not or WiFi was only available in the clubhouse. But beyond that we discovered when we prepared to leave our starter had gone up and could not be out by the 11a.m. departure time. It was not until 3p.m. that a mobile repair service was able to replace it ,yet the management refused to accept our payment for the extra day we were there. I would recommend this park to anyone looking for an honest clean place to stop around the Wichita Falls area. Called from the road and the receptionist was very helpful and put our name on envelope on the board. When we arrived, they were closed, however the custodian drove us to our spot and chatted with my wife while I backed in and set up. Very clean and hospitable. They had pull thru’s and back ins. It was almost full and we had a great shaded spot. We used the pool for about an hour to cool off and relax. Left the next morning back to 287, about a mile. Easy on and off the road. This is a park we would like to come back to and stay a little longer. Roads into the park and inside the park are easy to navigate. Check in was fast and friendly. There are 461 sites in this park with 138 of them full hook-ups. We were in Site 42, which is a super long gravel site, could have put two of our 37-foot class A with a tow-dolly on the site and still have plenty of room to park our car. Plus they are a little wider than average. There were no problems with the hook-ups and we had 50amp electric. The campground is very well maintained and road noise was minimal. There is a pond as well as the park being right on the Wichita River. Very beautiful and peaceful. Plenty of space to walk the dog, including two designated areas, not fenced. The laundry and bathrooms were clean. The four star rating is due to the spotty WiFi. We stayed October 31 - November 2, 2017. we paid $40.50 a night with our Good Sam discount. You are close to town and all shopping. Stayed here one night on our way from out west going to Dallas. We checked in late and had no problem. The site was huge for our 25' class C towing. Our total length is 44 feet and there was huge amount of space on both ends after we got parked. FHU with 30 amp. Roads and sites are packed gravel, no problems. 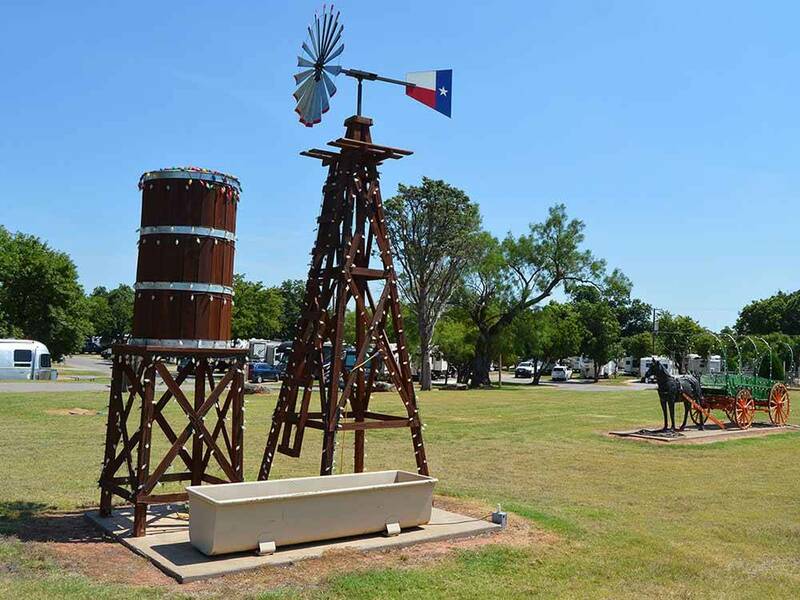 We used this park as an overnight stop from Houston to points north. Very clean and well kept. Restrooms small but nice. Sites long w/ gravel base and large concrete patios. Wifi good, cable ok as a few HD channels but most analog. Great H2O pressure & we were in site 51 by the Wichita River. Staff very friendly and helpful. This park is a refabbed trailer park & there a few live ins but all very well kept. We will use this park again and highly recommend it. Goodness. The Good Sam Directory Rating was 9/10/9 so we had high expectations. On entering, the signs were faded and the asphalt patched and bumpy. The office personnel was not unfriendly but certainly not friendly. The utilities were as advertised (proper power, water and sewer) but definitely needed some updating. The most disappointing were the bathrooms which were dirty (mud on the floor and the toilet needing attention both in the afternoon we arrived and upon departure the next morning) and unappealing in all ways. We will not stay in this park again and certainly question the validity of the rating. We left at dawn. Very nice campground with friendly staff and excellent Internet service. Easily made phone reservation same morning. Easy access via Google maps. Very pleasant staff. Long level unpaved pull through with paved park roads. Sites well spaced and not crowded. Hook ups good. Wi-Fi internet "lightning fast". Multiple trash cans around area and nice dog walking area. Nice pond (with geese) on property and backs up to small river (or large creek). No road or train noise. Would definitely stay again. Now this park is properly rated. Easy backin & pull thru sites. Bathrooms are warm, clean with place to put your soap, and they all work. Even the wifi actually works well. This is a fail at most parks. This demonstrates it needn't be that way. Very long level pull thru with concrete patio and picnic table. Nice grass well kept, not too close together. Owner active on site keeping things nice. Good number of trees and they could use some trimming. Stayed 3 days and will definitely return. Great park! Big easy to access sites. Green and Shade everywhere. Excellent private bathrooms are very clean and modern! Very nice staff. Maintenance staff on site. Easy in and out. Lots of space between sites. I have stayed here at least 10 times and have always had a good stay here! Park has a nice pavilion and walkway to a big pond and access to the river that is at the rear of the park!